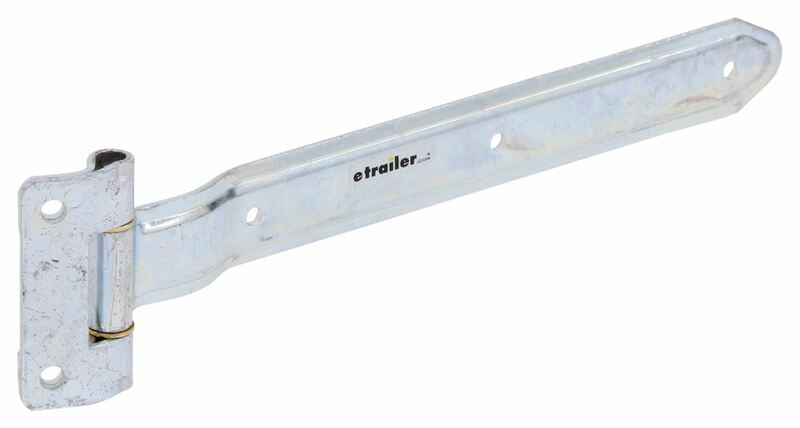 Square Corner Hinge with Reverse Bracket - Zinc Plated Steel - 16"
Call 800-298-8924 to order Polar Hardware enclosed trailer parts part number PLR2216 or order online at etrailer.com. Free expert support on all Polar Hardware products. Guaranteed Lowest Price and Fastest Shipping for Square Corner Hinge with Reverse Bracket - Zinc Plated Steel - 16". Enclosed Trailer Parts reviews from real customers. Square corner hinge with reverse bracket allows 270 degree door swing. 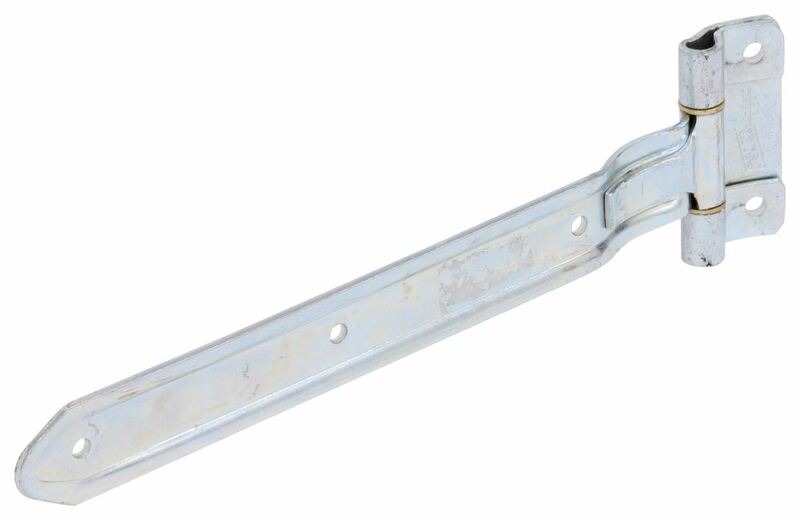 2216 Polar Hardware Square Corner Hinge with Reverse Bracket - Zinc Plated Steel - 16"
Hinge is ideal for refrigerated vehicles and trailers. Reversible pin allows it to be used on left-hand or right-hand doors. Nylon bushings and thrust bearings provide seamless operation. Video of Square Corner Hinge with Reverse Bracket - Zinc Plated Steel - 16"
Today we're going to be taking a look at the square corner hinge with reverse bracket for trailers. This is going to allow for 270 degree door swing. It's made from a very sturdy steel construction. It's going to have a zinc plating on it so it's very strong and durable. It's going to be rust and corrosion resistant. You'll want to mount this on the corner of the trailer to allow for full door swing. It's going to feature a non-removable pin for maximum security right here in the hing. If we take a measurement of the strap width, going this direction edge to edge we're looking at a measurement of around two inches. If we take a measurement of the strap length, what I'm doing to get this measurement is I'm measuring from the back of the flat side here of the hinge to the end of the strap. You can see that's where we're going to get our 16 inch mark. It's also very close to the center of that non-removable pin out to the end of the strap around 16 inches. Overall length, if I go to the back of the hinge to the end of the strap, we're looking at a measurement a little bit closer to 16 and 1/2, 16 and 5/8, right in that area. Right here on the hinge there's going to be 2 mount holes. These mount holes are going to be separated apart from one another on center, looks to be 3 and 1/4 inches. The hinge edge to edge that's going to give us a measurement of 4 and 1/2 inches. If we measure this direction, we're looking at a measurement of, from this point here to the back we're looking at about 2 and 1/8 of an inch. The holes on the hinge, those are going to have a diameter of 3/8 of an inch. Then you can see how that allows the unit to swing, so it's got a rotating design. If we take a measurement of the holes here on the strap, these are actually going to be separated on center, so there a hole right here, so center of that hole to center of this hole is 5 and 5/8. Center of this hole to center to center of this hole is also 5 and 5.8. Then those are going to have a diameter of 5.16 of an inch. That's going to do it for today's look at the square corner hinge with a reverse bracket. Corner Hinge with Reverse Bracket # PLR2216 does not include the mounting hardware. The reason for this is primarily because different mounting surfaces will require different mounting hardware. So you would source the appropriate hardware locally to match the material the surface is made of. Will Polar Hinge # PLR2216 Support a Ramp Door? The Square Corner Hinge with Reverse Bracket - Zinc Plated Steel - 16" # PLR2216 are not rated for a weight limit. 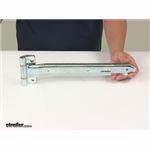 For a ramp door, I recommend instead using the Ramp Door Hinge - Steel # PLR1902 which is a much thicker metal and a stronger pin. This is designed for that function and needs to be welded in place. The Square corner hinge although easier to install would risk hardware failing as they aren't designed to hold weight beyond the door itself. Product arrived very quickly. Everything was there and fit properly. I'm very satisfied.